Mario Batali Steps Aside From His Restaurants Amid Sexual Misconduct Allegations : The Two-Way Four women described how Batali touched them inappropriately, and others said they witnessed bullying and lewd comments. Batali doesn't deny the allegations, saying they "match up" with past behavior. Celebrity chef Mario Batali in October in New York City. Batali said Monday he was stepping aside from day-to-day running of his businesses amid allegations of sexual misconduct by women who worked for him. Celebrity chef Mario Batali is stepping aside from directing his restaurants and taking leave from his TV cooking show following reports of sexual misconduct over a 20-year period. "Three of the women worked for Batali in some capacity during their careers. One former employee alleges that over the course of two years, he repeatedly grabbed her from behind and held her tightly against his body. Another former employee alleges that he groped her and that, in a separate incident, he compelled her to straddle him; another alleges that he grabbed her breasts at a party, though she no longer worked for him at the time." "Minutes into their conversation, she recalls, he told her, 'Come work for me, I'll pay you double what you're making.' Moments later, someone bumped her glass, spilling wine all over her chest and down her scooped-neck shirt. She alleges that Batali began rubbing her breasts with his bare hands while saying something like, 'Let me help you with that,' as he groped her chest. 'He just went to town, and I was so shocked,' the chef says. 'Jaw on the ground, I just stepped back from him in utter disgust and walked away.' "
In the article, a number of other current and former employees at Batali's restaurants described bullying and lewd behavior. Some said they had complicated feelings about Batali, who has also championed a number of women's careers and started a children's education and empowerment foundation. Batali did not deny the allegations, admitting they comport with his past conduct. "I apologize to the people I have mistreated and hurt," Batali said in a statement to Eater. "Although the identities of most of the individuals mentioned in these stories have not been revealed to me, much of the behavior described does, in fact, match up with ways I have acted. That behavior was wrong and there are no excuses. I take full responsibility and am deeply sorry for any pain, humiliation or discomfort I have caused to my peers, employees, customers, friends and family." 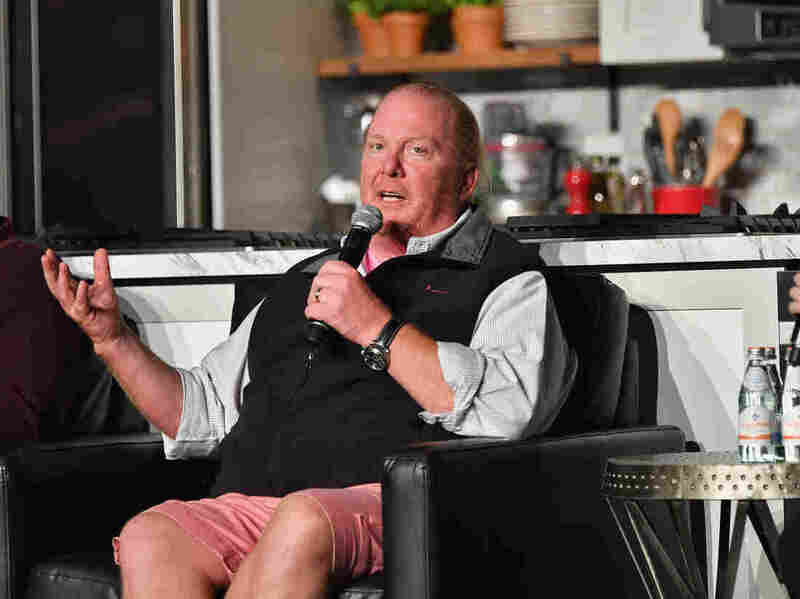 Batali will remain an owner at his restaurants, but he said he would hand over day-to-day oversight of his businesses while he works to regain the trust of those he has hurt and disappointed. A spokesperson for Batali's restaurant group, Batali & Bastianich Hospitality Group, told Eater that it had received its first formal complaint of inappropriate behavior by Batali in October. It said Batali was reprimanded and required to attend training. "We have strong policies and practices in place that address sexual harassment. We train employees in these policies and we enforce them, up to and including termination," the group said in a statement. "Mr. Batali and we have agreed that he will step away from the company's operations, including the restaurants, and [he] has already done so." Batali hosts a cooking show on ABC called The Chew. On Monday, the network said it has asked Batali to take leave from the program while it reviews the allegations. "While we are unaware of any type of inappropriate behavior involving him and anyone affiliated with the show, we will swiftly address any alleged violations of our standards of conduct," the network said in a statement to NPR. The allegations against Batali join a cascade of sexual harassment complaints against powerful men, including senior news managers at NPR. Batali rose to prominence in the mid-1990s with the launch of his Food Network show Molto Mario, which ran for 10 seasons. He and Joe Bastianich opened the restaurant Babbo in New York's Greenwich Village in 1998. He now has 10 restaurants in New York, as well as eateries in Las Vegas, California and Singapore. He is a partner in Eataly, the Italian food emporium with locations around the world. In 2012, Batali and Bastianich agreed to a $5.25 million class-action settlement with employees who claimed the partners' restaurants had illegally confiscated part of their tips.